You’ve probably seen traditional braces – with all of their brackets and wires – being used by a loved one to get the straight teeth of their dreams. However, traditional braces are not for everyone, and thankfully there is another option for getting straighter, more beautiful smiles out there. This option is called Invisalign. 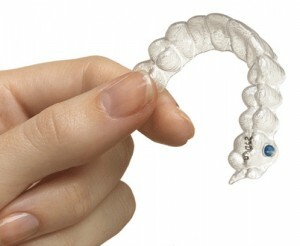 Invisalign is a clear braces system that never uses brackets or wires. Instead, Invisalign uses a system of special aligner trays made of a clear, durable plastic that gradually straighten teeth, comfortably and safely. For adults in particular, traditional braces are not always practical. Invisalign has adults in mind who want to have straighter smiles without the hassle. Time | Invisalign helps straighten teeth in as little time as nine months to a year (and in some cases, even faster) depending upon your situation. Compared to traditional braces that take on average two years, Invisalign is a much quicker solution. Convenience | Invisalign clear aligner trays are removable, meaning that when you want to eat something, it’s just as simple as taking out your trays and enjoying your food. Unlike traditional braces, Invisalign allows you to continue to take care of your teeth like you normally would, and eat the foods that you love. Appearance | Because Invisalign trays are made of a nearly invisible looking plastic, it means you can straighten your teeth without people having to know about it. Design | Invisalign trays are custom designed for each patient so that they work effectively, and feel comfortable. We are excited to be able to offer Invisalign as an alternative to traditional braces to our patients who would like to straighten their teeth, and beautify their smiles. If you have questions about Invisalign, or would like to get a straighter smile without traditional braces, please give us a call today! Offer ends April 30, 2015. Offer cannot be combined with any other discounts or promotions.